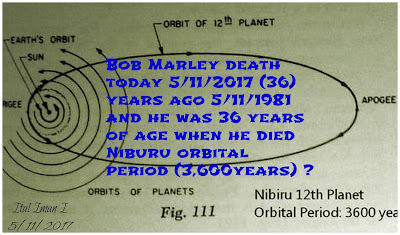 what does Nibiru has to do with the 36th year death memorial of Bob Marley? The time had come that the all-knowing universe send us two redemption movements In the personage of the nation of Islam and the Rastafari movement. these were the two witnesses of book of revelations. As foremost exponent of The Rastafari mystery upon the mystic 36th year of The transition of The Prophet Bob Marley who lives on forever in the etheric realm his music through the electromagnetic spectrum and in our souls and hearts as I/I . In this great confrontation against the mystery Babylon. I present in collage format a kabalistic View of this united truth, showing that the prophet Marley was aware of our connection with nation of Islam, this wisdom was revealed in the lyrics of the song (I know) which was on the confrontation Album. Ethiopia holds the most ancient and complete bible on Earth. Written in the ancient language of Ge’ez it’s nearly 800 years older than the King James Version and contains 81-88 books compared to 66. It includes the Book of ENOCH, Esdras, Buruch and all 3 Books of MACCABEE, and a host of others that was excommunicated from the KJV. We will now look at the Book of Psalms (Hebrew: תְּהִלִּים‎‎ or תהילים‎, Tehillim, "praises") which was derived from the Kemetic (Egyptian) Religion specifically, “Psalms 40” and “Psalms 104” whom many scholars have found similarities with that of the Great Hymn of Aten written by the Pharaoh Akhenaton. Thus, the character David (TUT or Tehuti) and Moses (Shu or Ma-Shu) which the Psalms are link to is also base on Akhenaton as well. The word "Psalm" signifies music accompanied by stringed instruments. The book is a collection of hymns dedicated to God (Gods), and many of them foretell the coming of the "Mythological Messiah" and predict events that were fulfilled and embodied in the life of Bob Marley. The Great Egyptologist and Scholar, Gerald Massey stated, "The uninstructed Jews, the idiotai, at one time thought the [Messianic] prophecy which was astronomical, and solely related to the cycles of time, was to have its fulfillment in human history. But they found out their error, and bequeathed it unexplained to the still more ignorant Christians"
However, unbeknownst to Massey is that the Astro-theological story of the Savior (Meaning the path of the sun through the zodiacal houses) was to be fulfilled in "Human History" on the Terrestrial plane. Note: "As above so below, As without so within" is an original Kemetic axiom and was written on Egyptian tombs from the Pre-dynastic period. Even Marley once said, "Man is a universe within himself"; microcosm of the macrocosm. All of the "Messianic Psalms" which was attributed to the fictitious character called Jesus or Yahushua was never fulfilled by him but was meant for the "eschatological Christ" embodied by Bob Marley in our time. The verse below is only one example of this fulfillment especially, when it is understood in the original Hebraic form, the allegory of the Psalms is unravel. This verse below proves that Marley was indeed given the pair of boots which had the hidden copper wire embedded inside, carrying a carcinogenic chemical compound on it that had poked his big toe which later turns out to be melanoma skin cancer. Psa.140:5 "The proud have hid a snare (pair of boots) for me, and cords (copper wire); they have spread (break in two groups) a net (bird trap=assassination attempt & pair of boots) by the wayside (56 Hope Road/Strawberry Hill); they have set gins (copper wire hidden inside the boots) for me. Selah." The word 'snare' in this passage is the Hebrew word 'Pach' meaning "a thin plate of metal (as pounded thin/sheet)" and can symbolize a boots or steel toe boots (Note: Some midsole are made of steel since the bottom of a boots is form by cutting a "thin plate of metal" into the required size and shape). Pach can also mean Gin i.e. foot-hold trap (Gin Trap), symbolizing the pair of boots as well (the feet is held inside the boot and the trap is the copper wire which poked him). Also, a 'thin metal' can represent wire or a plated copper wire since copper is a metal. Note: The 2 instances where 'Pach' is used within the book of Exodus and Numbers is in reference of the metal being either gold or copper. The word 'Cord' in Hebrew is 'Chebel' meaning rope, cord or line and is derived from 'Chabal', means 'to twist'; as in wires. The Hebrew word "Chabal or Chebel" is the homophone of the English synonym "Cable". The word 'Spread' in Hebrew here is "Paras" meaning to break in two, divide or scattered i.e. (of a group of people) separate and move off in different directions. This is exactly how the CIA attacked Marley: One group ambushed him at his hope road home, and the other group covertly infiltrated his hiding place in the Blue Mountains and presented him with a gift (pair of boots). What's intriguing is that 'Paras' also means "Display," as in a present or gift i.e. the pair of boots which was given to Bob as a gift by Son of the CIA. The Hebrew word for 'Net' is "Resheth" and denotes a trap for catching birds, as well as a trap for catching man (i.e. by raising him up to the sky or suspended upside down from a tree by one foot, symbolizing the copper wire inside the boots). It is related to the Hebrew "Reshith" (beginning) and Egyptian "Res" (to raise up, suspend) but comes from the Hebrew root 'Yarash', meaning "to take possession of, to occupy, to capture, to cast, to expel an occupant by driving him out"; as in "Upland Hunting". Upland hunting is a type of strategic warfare in the form of bird hunting in which the hunter pursues upland birds by employing the use of gun dogs to locate and retrieve the game (birds). The average group consists of 2-4 hunters with 1-2 dogs. Depending upon their method of work, some dogs flush out the game by first finding the game (bird) then driving it from its hiding place for a hunter to shoot or capture. In this similitude was Marley hunted: First he was driven out of his Hope Road home after being ambushed by members of the Shower Posse (dogs), and then fleeing into the Blue Mountains retreat (metaphor for shooting down the bird while in open air called wing-shooting) where he was then captured by the "poisoned boots" provided by either Carl Colby or Neil Bush (both were agents of CIA with their fathers heading the agency at one point). Note: Even while in exile Bob was captured in the hospitals/clinics and then finished off later by Ex Nazi doctor in Germany. The word "Wayside" in Hebrew is "Yad" and means forearm or hand but it can also mean strength. However just as a hand is on the side of the body, the term yad can also be used to describe a place other than one’s regular location, such as the outskirts of a city or an encampment. Marley was also said to have been tucked away in his secret encampment, which was at Strawberry Hill, the Blue Mountains retreat owned by Chris Blackwell. Note: The Blue Mountains stretches from the outskirts of Kingston to the eastern edge of Jamaica. Psa 22:16 "For dogs (gun men) have compassed me (assassination attempt): the assembly of the wicked (company of evildoers) have inclosed me (with the pair of boots): they pierced my hands (forearm) and my feet (big toe)". The word inclosed in Hebrew is “NQP” (naqaph) meaning “to strike,” or “to encompass ,” or “to enclose;" which seems to give the implication of the pair of boots given to Bob which poked him, since a boots is an enclosure for the feet. Also, the word 'pierce' in this passage is 'Karah' meaning "to dig" or "make a banquet" as used in 2 Kings 6:23 and the Osiris drama of Egypt; banquet figuratively symbolize the Smile Jamaica Concert, since bob was shot in the forearm 2 days before the concert (organised by Prime Minister seeking re-election), and was poked in the Toe by the boots on the day of the concert. The word Hands is 'Yad' meaning "forearm" and the word 'Feet' in Hebrew is "Regel" (anything connected to the feet, eg. forefoot, hindfoot, midfoot) and can mean 'Toe' i.e. Big Toe, as in the case of Judges 1:6. 1) Osiris like many of the Egyptian gods original came from the kingdom of Kush/Punt before he was venerated in Egypt. It was also said Marley's maternal grandmother has Egyptian roots while his maternal grandfather was from the Cromanty tribe of the Akan People. However, the Akan People also originated from the Kingdom of Kush (Nubia) before settling in ancient Egypt and then migrated to west Africa in Ghana over time (the Twi Language of the Akan people is similar to the Medu'netjer). 3) Osiris taught the people of the land of Egypt about farming (agriculture). Osiris was one of the first "Green Men", in that he was also the god of vegetation and corn. Likewise Bob Marley came from the farmland in Nine Mile and was known as a "Farmer At Heart". The number 9 symbolizing 'The Ennead' - group of nine deities in Egyptian mythology which Osiris is apart of. 4) Osiris was tricked and murdered at a Banquet (Party) his brother Set held in honor of his return. Likewise Marley was shot 2 days prior to the Smile Jamaican concert, which was organised by Prime Minister Michael Manley seeking re-election. Bob actually wanted a non-political free concert to help ease tensions between the political forces, but the incumbent PNP moved the date of the election to coincide with the concert, effectively turning it into a rally for the government. Bob was furious and danger crowded in upon his Hope Road home. The Banquet can also symbolize the "Peace Concert" which was held after Marley had returned to Jamaica after the assassination attempt. 5) Seth obtained the measurements of Osiris's body in private and constructed a coffin to fit him perfectly and then throws a great party in honor of Osiris. Seth then used the old party trick of “who the coffin fit can keep it” as a gift (in the form of a Coffin) to get back at Osiris. Likewise the CIA had obtained the measurements (foot size) of Bob's feet and on the very day of the Smile Jamaican concert Carl Colby, son of Ex CIA director William Colby made his way up to the mountains and gave Marley a gift in the form of a pair of boots with the hidden copper wire embedded inside, carrying a carcinogenic chemical compound on it that had poked Bob's big toe which later turns out to be melanoma skin cancer. 6) As soon as Osiris laid down in the coffin to prove that it fit him, Seth and his 72 conspirators quickly sealed it with nails and dumped the coffin into the Nile river. The number 72 (companions of Set) as in 7 and 2, symbolizes the 7 gunmen who first stormed into Marley's home "arm to the teeth" during the assassination attempt. Followed by the 2 sons of the EX CIA directors (Carl Colby and Neil Bush) who had disguised themselves to infiltrate Marley's hideaway in the mountains and provided him with the pair of boots. Thus the bullets, copper wire & needles that pierced Marley would be likened onto the nails that fastened the coffin of Osiris within it. Hence the expression or phrase, "the final nail in the coffin" meaning Something that might hasten or contribute to one's death. 7) Seth dismembered the body of Osiris into 14 pieces and scattered them throughout Egypt. Likewise after the assassination attempt and Smile Jamaica concert, Bob went into exile in England for 14 months (December 1976 - February 1978); Thus symbolizing the 14 pieces of Osiris. Its also good to note Jamaica is divided into 14 parishes. 8) Osiris reigned for 28th years. Though they are other sources who tell us that he actually lived for 28 years. Bob was only 31 years old when both the assassination attempt and pair of boots incident occurred. 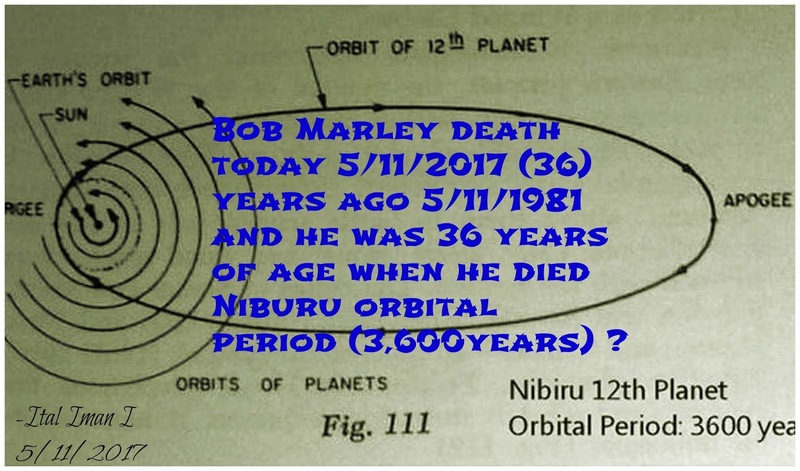 Both Osiris and Bob were of young ages and both numbers 28 & 31 represent the moon cycle: It takes the moon 28 days to orbit the Earth; it makes this orbit 13 times each year (13 backwards is 31). Hence, the birth month of Marley is February (Black History Month) comprised of 28 days, while the other months are 30-31 days. 9) When Isis found out what Set had done, she was beside herself with grief and then set off to find Osiris. Isis was able to find her husband because of a vision she sees. Now author Timothy White offers very interesting insights into Bob’s final days painting the picture of an isolated dying man separated from his loved ones. Even after collapsing in the middle of an American tour, the inner sanctum of Bob’s entourage would not inform his family, nor wife Rita or let her near him. Like Isis before her, Rita seeks out Bob in vain after a weird dream during which she saw him wasted, dreadlocks fallen and talking to her from a hospital fence. When she woke and finally tracked him down, he looked so ancient and hardly recognizable. As Bob narrated his fate to her, Rita wept uncontrollably.